Indulge in the upper-echelon of lodging at the Ritz-Carlton Orlando, Grande Lakes, complete with rooms and suites available to capture the stunning views plus a full array of amenities for whatever you’ll need during your stay. Ritz-Carlton Club Level reservations can make the stay even more enchanting with several exclusive experiences included as well as 24-hour access to the Club Lounge, five culinary offerings served throughout the day and much more. Fine dining is available throughout the hotel with 13 restaurants, featuring everything from superb chops to flaky pastries, and serenity awaits when you book an escape to the Ritz-Carlton’s 40,000 square foot full-service spa. The hotel also features more than 147,000 square feet of meeting spaces for private events and receptions of any occasion and six elegant wedding venues aim to make your special day as delightful as you’ve imagined. 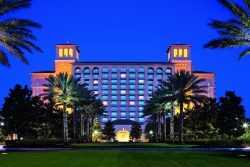 To learn more about the Ritz-Carlton Orlando, Grande Lakes, visit ritzcarlton.com/en/hotels/florida/orlando or call (407) 206-2400.